Vijaydurg (sometimes written as Viziadurg), the oldest fort on the Sindhudurg coast, was constructed during the regime of Raja Bhoja II of the Shilahar dynasty (construction period 1193-1205) and restructured by Shivaji Maharaj. Earlier, the fort encompassed an area of 5 acres and was surrounded by sea on all four sides. Over the years the eastern trench was reclaimed and a road constructed thereon. Presently the area of fort is about 17 acres and is surrounded by the Arabian Sea on three sides. Shivaji Maharaj extended the area of the fort by constructing three walls on the eastern side, each 36 metres high. He also constructed 20 bastions. According to legend, this is one of only two Maratha forts where Shivaji Maharaj personally hoisted the saffron flag. The other fort is Torna. Its locational advantages include the 40 km long Waghotan/Kharepatan creek. Large vessels cannot enter the shallow water of this creek. Also, Maratha warships could be anchored in this creek and yet remain invisible from the sea. It is a protected monument. In 1653 Shivaji Maharaj had captured this fort from Adil Shah of Bijapur and renamed it as "VijayDurg". The original name of the fort was "Gheria" and the first fortification appears to have been constructed in 1200 during the regime of Raja Bhoj II. Shivaji Maharaj developed Vijaydurg as an important base for Maratha warships. Maratha Empire looked to be in a decline after death of Shivaji Maharaj In 1680, when his son and successor Chhatrapati Sambhaji was captured by Mughal Emperor Aurangzeb and brutally tortured to death on 21 March 1689. Later in that year the fort of Raigad fell in the hand of Mughals. Wife of Shambhaji and his infant son Shahu along with many others were captured and were treated as state prisoners. Shivaji Maharaj�s second wife�s son Raja Ram then took in charge of the Maratha Empire. Inspired by the valiant death of Shambhaji, they fought back against the Mughals. It was during his reign Kanhoji Angre alias Conajee Angria became admiral of naval army of the Marathas. In 1698, Kanhoji made Vijaydurg the capital of his territory along the coast. In 1700 Raja Ram died. Tara Bai,the brave widow of Raja Ram took over the control of Maratha Empire. Putting her infant son on Maratha throne styled as "Shivaji II", Tara Bai led successful operations against the Mughal from 1700 to 1707. Taking advantage of discomfiture of Shivaji Maharaj�s ruling house Kanhoji Angre became the most "Powerful and independent Naval Chief of West coast of India". Tarabai gave Kanhoji title of Sarkhel (Admiral). At one time Kanhoji Angre was master of the whole coast from Bombay (Now Mumbai) to Vengurla. Aurangzeb died in 1707 and Shahu was released from the clutches of Mughals. He challenged Tarabai and her son�s legitimacy to the Maratha throne. The Marathas were divided but ultimately Shahu won the right to the throne as Chhatrapati and Tarabai was retreated to rule a small area of Kolhapur under the name of his son Shivaji II in 1713. She was later overthrown and imprisoned till her death by her husband�s second wife Rajas Bai. In the same year, Shahuji sent his Peshwa (Prime Minister), Balaji Vishvanath from his headquarters at Satara to negotiate with Kanhoji Angre. Kanhoji agreed to acknowledge allegiance to Satara and shift his loyalty from Tarabai. In return Kanhoji was confirmed command of the Maratha fleet, and granted twenty-six forts and fortified places with their dependent villages. 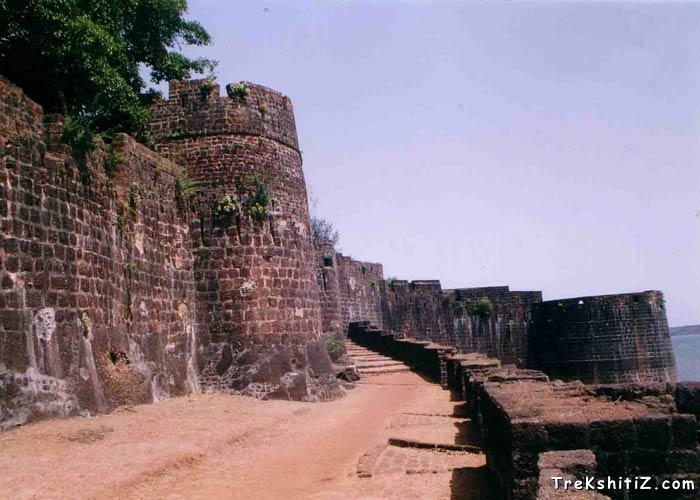 Vijaydurg is said to be the oldest fort in Sindhudurg coast. In the Pre-Independence era it was also known as "Eastern Gibraltar". This is because the fort was almost unconquerable. Under the leadership of Kanhoji Angre, it withstood many naval attacks by the British and the Dutch. Kanhoji Angre died on 4 July 1729 and the Angres control of the fort ended in 1756 after the Peshwa-British Alliance defeated the Angres clan. In 1818 Vijaydurg was completely in the hand of the British Empire. After the death of Kanhoji Angre, there were two short reigns by Sarfoji and Sambhaji. The two brothers Manaji and Tulaji started fighting for the Angre throne. Nanasaheb Peshwe had intervened in the disputes between Manaji and Tulaji. This created two spheres of influence, Manaji in the north at Kulaba and Tulaji in the south at Vijaydurg. Tulaji Angre was favored by Chhatrapati Shahu and was appointed as Sarkhel (Admiral) of the Maratha Navy. This was against the will of Nanasaheb Peshwa. By road:- Vijaydurg is 525 kms from Mumbai on the Goa highway via Talere junction. By Railway:- Vaibhavwadi railway station is 67 kms from Vijaydurg on the Konkan railway route.